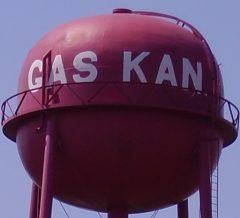 The City of Gas, obtaining it’s name from the abundance of natural gas that was found in the area, is a community in Allen County, in southeast Kansas. The City Brochure offers a summary of the services that are offered in the Gas Community. Situated along U.S. Highway 54, the city is about three miles east of Iola, approximately 100 miles south of Kansas City, and 120 miles east of Wichita. The interchange between U.S. Highway 54 and 169 is about two miles west of Gas. Gas has a population of 520 residents.